EXPO MENU 2015 - FISH MENU, AUTHENTIC FLAVORS AT THE TABLE A special event that will allow to enjoy all the taste of a rich and elaborated menu. The food will be accompanied by wines proposal that highlight the unique flavors of the dishes proposed. A theme night entirely dedicated to fish, a range of dishes developed to satisfy the most discerning palate. The historical restaurant Le Calandrine will be the picturesque setting for a night entirely dedicated to the fish menu. An elaborated proposal by the chef Luigi Barbiero - scallops, queen scallops, langoustine and octopus - are some of the royal ingredients used to realize an original and high quality menu. Dishes will be combined with wines from prestigious local companies. An evening in full harmony with the topics and targets of the Expo. The events related to Expo 2015, in fact, have a unique opportunity to learn, live and enjoy our magnificent region in a warm and friendly atmosphere. Availability for both lunch and dinner. 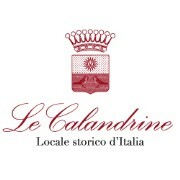 For those who want to find a cozy and charming environment, alluding to the nature in its entirety, for those who search and appreciate the products and typical dishes of the Treviso area, Park Restaurant Le Calandrine a place to "taste" with your eyes too. Ideal for lunches and dinners, for any occasion, work related or personal, for weddings, baptisms and anniversaries. All surrounded by a sophisticated atmosphere and evocative offset by a kitchen of high quality creativity. Once upon a time there was a tavern ... Born from the renovation of an old farmhouse used as a stable, in the landscape of river Piave, the tavern has been enlarged and evolved step by step by the will and commitment of the three partners - Gianni, Remo and Iliana - who believe in the beauty of the environment and the flavors of the territory. The hallmark of the Park Restaurant Le Calandrine's tavern its is own coat of arms, inherited from the Papadopoli family, counts originally from Corfu that lived in Venice, which inspired the name of the restaurant. The Calandra is in fact the bird representative of the Grave of Papadopoli (an area near river Piave), where it has found its ideal habitat.